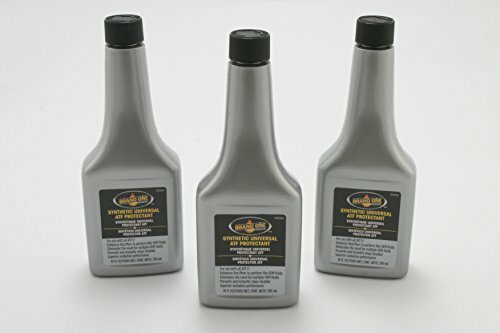 (3)10 oz Bottle of Brand One ATF protectant additive platinum for all automatic transmissions. Almost all transmission shops are using this product to keep transmissions from coming back due to failure. This additive greatly increases the life of your transmission by, reducing the friction in the transmission by over 50% and increasing the heat stability of the fluid by more then 30%. Can be used in any transmission that requires Dexron type fluid. Number one tool used by professionals developer of the conversion formula, Brand One highly friction modified-ATF supplement converts DEXRON II,III/MERCON ATF into a highly friction modified fluid. And at the same time extends your fluid life and reduces your transmission wear, saving you money and the need to stock multiple OEM fluids. Brand One additive supplement can be used to fit the operating frictional requirements of Original Equipment Manufacturers' (OEMs) fluid. This additive greatly increases the life of your transmission by, reducing the friction in the transmission by over 50% and increasing the heat stability of the fluid by more then 30%. %. Can be used in any transmission that requires Dexron type fluid. Brand One highly friction modified-ATF supplement converts DEXRON II,III/MERCON ATF into a highly friction modified fluid. Extends your fluid life and reduces your transmission wear, saving you money and the need to stock multiple OEM fluids. Brand One additive supplement can be used to fit the operating frictional requirements of Original Equipment Manufacturers' (OEMs) fluid.